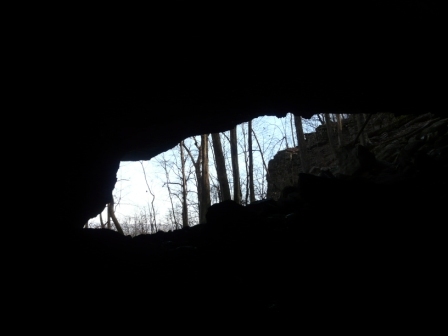 I rambled halfway down the mountain to visit some caves this morning. 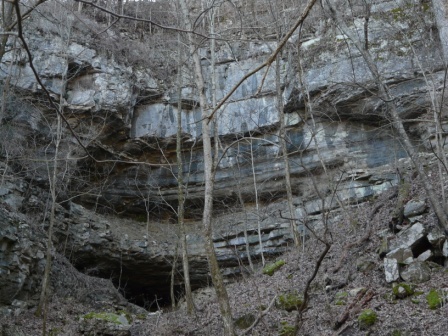 The Cumberland Plateau is a layer-cake of rock: the top layer is sandstone, the bottom is limestone. Sandstone does not dissolve in water, but limestone does. Over millions of years, this dissolution of rock by water has gouged holes in the lower reaches of the mountainside, creating an impressive network of caves. 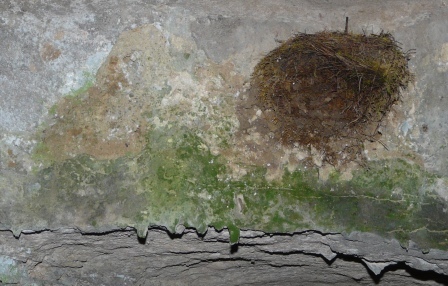 A phoebe nest on the inner wall of the cave, about fifty feet back from the entrance. These nestlings were raised in near darkness. Their first flight out into the world must have been a revelation. 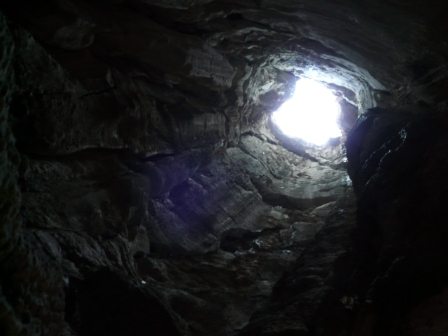 "Solomon's Temple" cave entrance. No Ark of the Covenant here, just limestone-adapted spleenwort ferns. 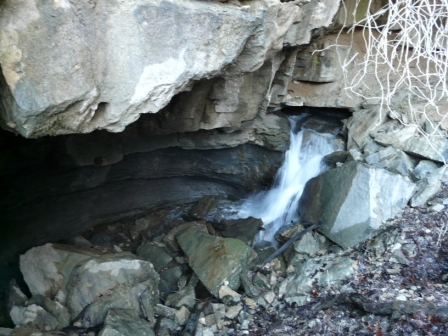 An underground stream surfaces briefly at the base of the cliffs. Inside the cave, this stream roars away at the bottom of large pits. I was by myself, so I did not scramble into the cave to see them again -- rule number one of caving is 'don't go inside dangerous caves alone'. 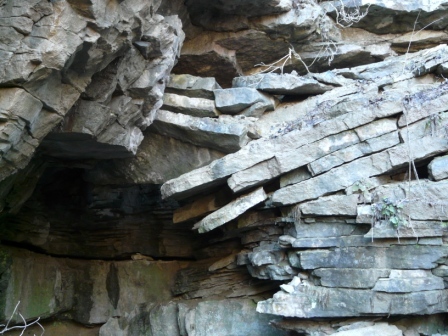 Multiple layers of eroding and fractured rock: another reason for caution. My favorite spot around these caves. 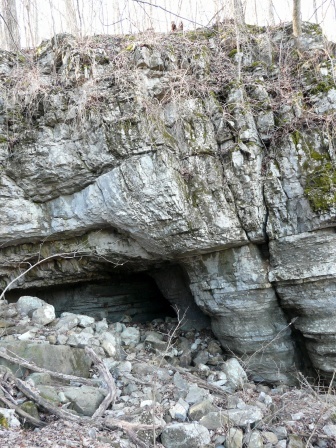 This is a vertical tube, about twelve feet wide, running straight down from a hole on the forest floor, emerging far below in a pile of debris on the side of the cliff face. 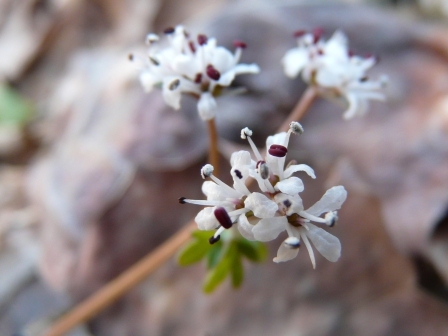 Just below the cliffs and caves, I found the first wildflower of the the year, “pepper-and-salt” or “harbinger-of-spring”, Erigenia bulbosa. It seems a little early to be harbinging the spring — we’ve got plenty of winter to go yet — but it is good to be reminded that spring will come. These little flowers belong to the carrot family and their tuberous root is supposedly edible. I’d rather leave them rooted and feed on the hope they offer. This entry was posted in Plants, Rocks, Water on January 29, 2012 by David George Haskell. The pepper-and-salt flowers are lovely! Today, I admired snowdrops and daffodils blooming in Abbo’s Alley. What happened to winter anyway? Wonderful photos and info. Thanks so much. Sad irony that now I’m at the perfect place for exploring, and I have a knee that’s avoiding surgery. Glad to take these walks vicariously through your welcome rambles. …I believe that it is alumroot. Good eye!